Around Lake Garda there are a variety of different places to explore, some harder to find. The mild climate of the lake contributes to a flourishing natural environment, typically Mediterranean with lemon groves, olive trees and vineyards in the lowlands. But all you have to do to get some great mountain views is go up onto the slopes. 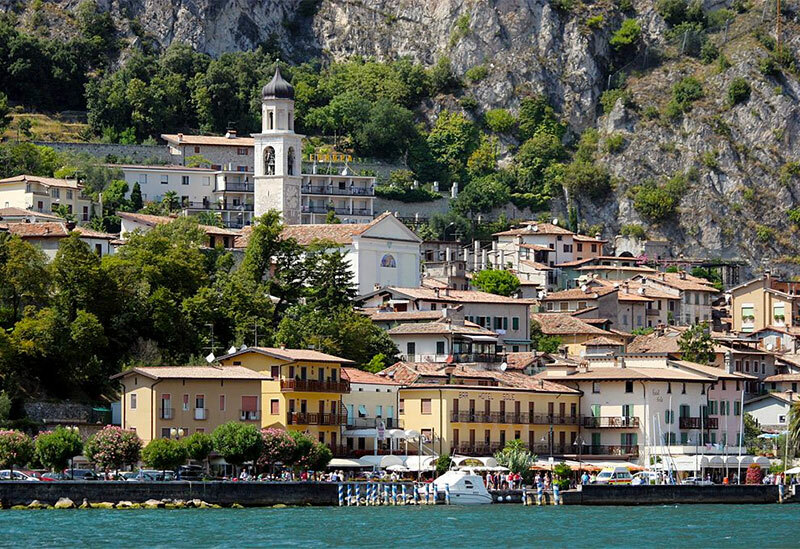 Romantic waterside villages, lakefront walks and picturesque views can all feature in your holiday to Lake Garda. On this page we’ll tell you a bit more, but we’re also waiting for you at our hotel to show you first-hand the magic of the Lake and its surroundings. 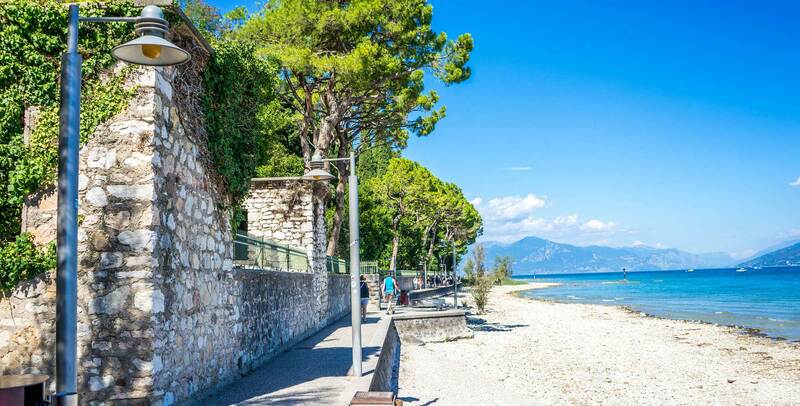 Facing the lake and protected by the Moraine hills, Bardolino is one of the most popular tourist locales on the western shore of the Garda –only 30km from Verona. 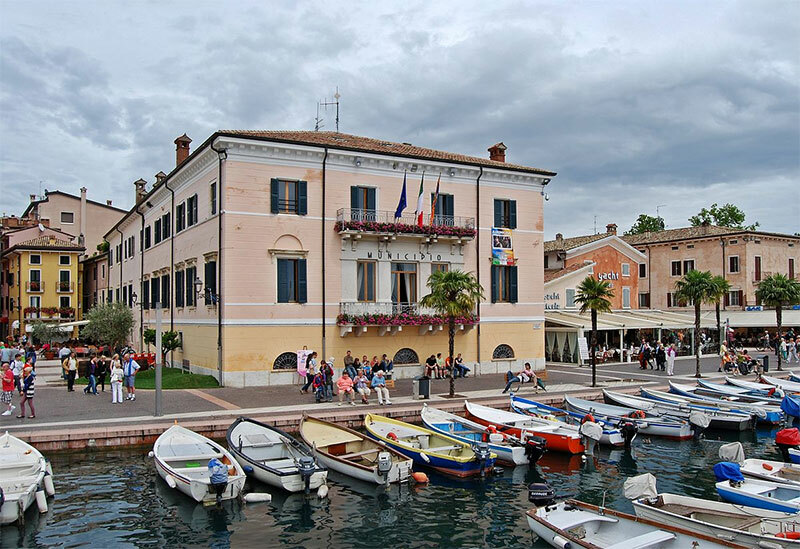 Must-sees are the castle, over a thousand years old, the medieval churches and the Museo dell’Olio d’Oliva (Museum of Olive Oil), which showcases this classic Bardolino product, rivalled only by the eponymous wine, a quality red (DOC) only produced in the Veronese province. Limone is the first town on the Brescia shore of the Lake for those on their way down from Trentino; once upon a time it was a small village for fishermen and lemon farmers. Between the mountain and the Orti and Castello streets, you can visit the Limonaia del Castèl, a series of stone and wood conservatories constructed in the 1700s to protect citrus plants from cold and wind. Alongside the aroma of lemons, in the conservatories you’ll also get the scents of lime, grapefruit, tangerine, mandarin orange, bitter orange, clementine and kumquat. 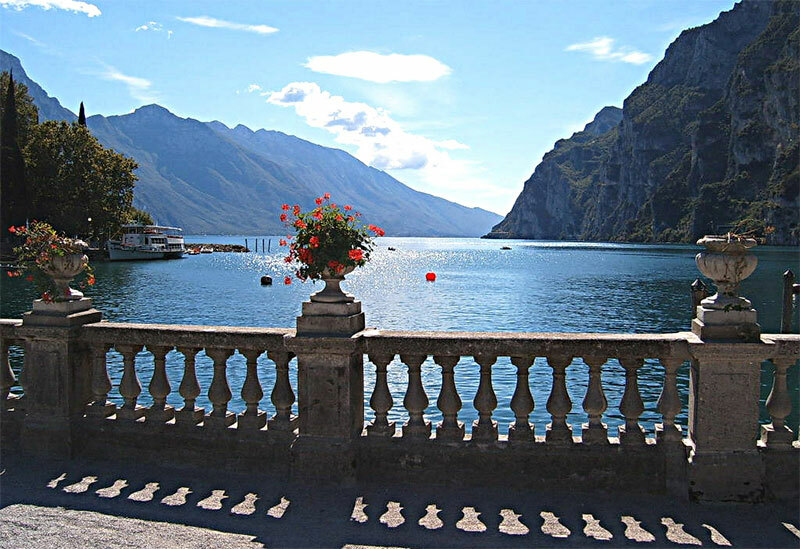 In addition to the lakeshore side of Limone, we suggest you take a stroll in the old town, with its narrow, cobbled, uphill streets, stone houses, flowery balconies and evocative views. On the Brescia shore of the lake, at the gates of the Riviera dei Limoni, lies Gardone Riviera. The town boasts a lovely lakeshore esplanade and an atmosphere of composed elegance. At the start of the lakeside walk shines the Grand Hotel, constructed towards the end of the 1800s. Located in the district of Gardone is the Vittoriale degli Italiani, the monumental citadel established by Gabriele D’Annunzio and where the poet spent his last years. Before crossing the entrance of the Vittoriale, we recommend you spend some time in the Andre Heller Foundation Botanical Gardens, also known as the Giardini Hruska, a green oasis of plants and flowers from every part of the world. The symbol of this town is the Castello Scaligero. According to scholars, it dates back to ancient history, perhaps almost to the 1st Century BCE. If you’re looking for a breathtaking panorama of the lake, climb up to the tower of the castle. At the foot of the castle you’ll find the artist’s quarter, with painters’, sculptors’ and artisanal workshops. A little further on is the Palazzo dei Capitani, adorned with a small floating garden, a marina and a romantic lakeside path. 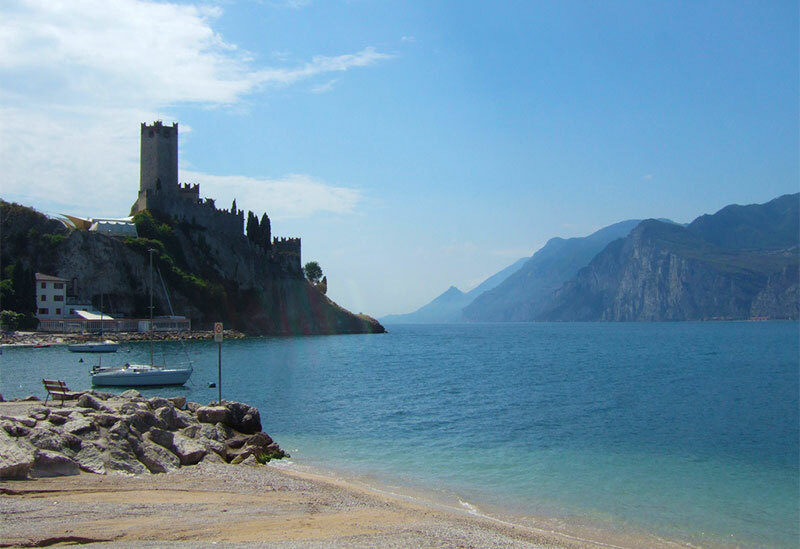 From Malcesine you can take a sail boat to the Isola del Sogno and the Isola del Ulivo. You can also catch the funicular from Malcesine up to Monte Baldo; its panoramic cabins rotate 360° and offer an incredible view over a good portion of the lake. 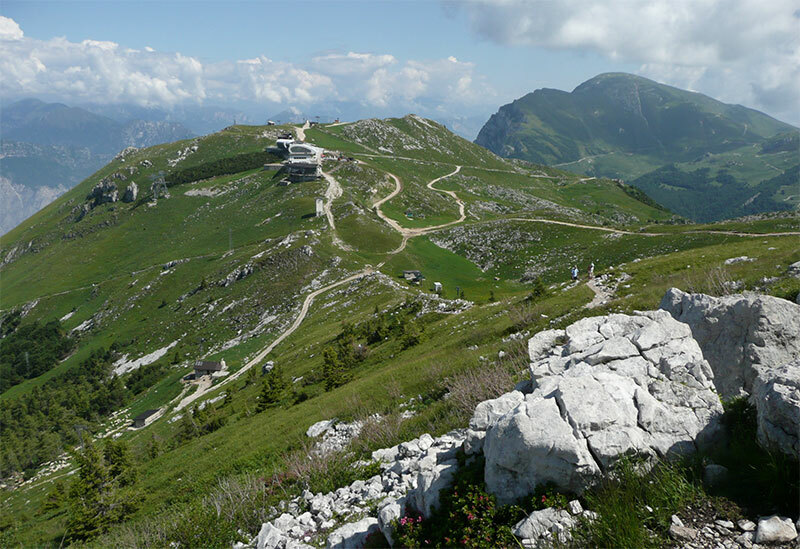 Monte Baldo is a unique natural oasis that stretches from the Mediterranean scrub up to the highest alpine meadows. Also known as the Garden of Europe, in the right season Monte Baldo offers immense plains, open air walks and an incredible view over Lake Garda. In winter, you can get to one of the four skiing stations on the mountain. The Baldo is frequented by families with children as well as by paragliding enthusiasts. Near the lodges higher up on the mountain, you can see Alpacas, a variety of llama bred in the mountain pens, grazing peacefull on the grass. The forest fauna of the Baldo includes, among many animals, golden eagles, squirrels, foxes, ermine and marmots. 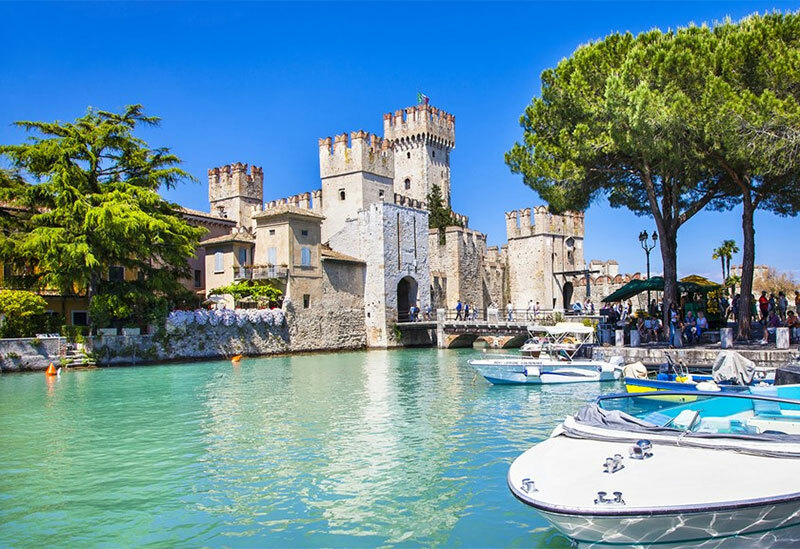 Known as the Pearl of the Garda, Sirmione is loved by all, whether Italian or foreign. Its medieval village encircles the Castello Scaligero, an important fortress that seems to surge out of the very waters of the lake. On the far point of the Sirmione peninsula is the marvellous Grotte di Catullo, an archaeological park that holds the remains of an ancient Roman villa. Sirmione is also known for its hot water springs. The best place to get some rest and relaxation is Aquaria, a wellness centre with saunas, Turkish baths and heated pools facing the lake. Lush palm and olive vegetation grows right on the shore of the lake. A little above the towns, the mountains dip into the waters of Lake Garda. The wind blows and drives surfers onto the tops of the waves. 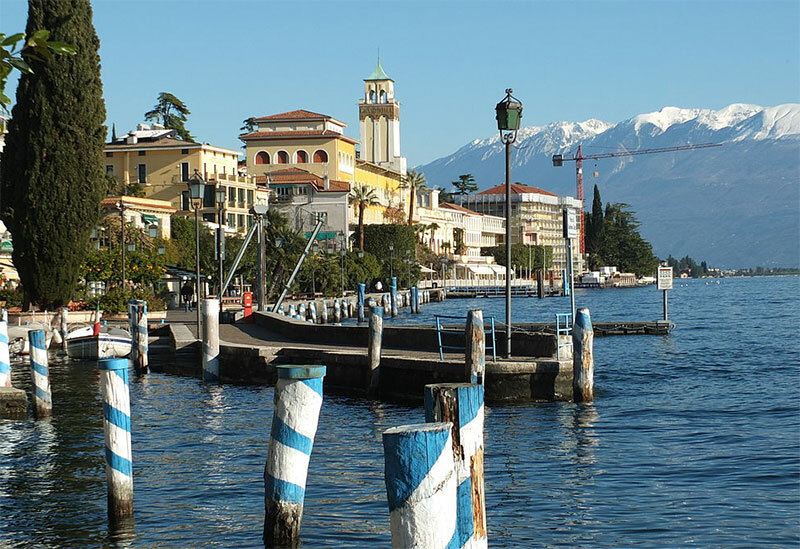 Riva is small and elegant, with shops and cafes on the lakeshore, as well as parks and flower gardens. The heart of Riva is the Piazza III Novembre, surrounded by medieval porticoes and by the Palazzo Pretorio, the Palazzo Municipale and the Torre Apponale del Duecento. Worth seeing a little outside the town are the Cascata del Varone and the oasis of Monte Brione, two places especially recommended for nature lovers.